Here we are in February, and the garden hasn't woken up yet for spring. I am not trying to rush life, but I am anxious to see my hydrangeas as they come into bloom in June. Last year, I did not really get a chance to appreciate them. My youngest was graduating from elementary school, and as the school year drew to a close, we were busy with all sorts of graduate-type activities. And right after school finished, I had the Lapidus bunionectomy (major foot surgery) which kept me captive upstairs in my bedroom for much too long. No trips outdoors for me. My kids clipped hydrangeas and brought them inside for me, which was great, but it's not the same to a gardener who wants to be outside with her plants. I made this card a couple of years ago, and it got lost in my computer files. At long last, it's making its debut here on the blog. I used Stampin' Up! 's Because I Care hydrangea, Natural Beauty butterfly (moth?) PLUS single leaf (tucked under hydrangea leaf) and a bee from Queen Bee / Pink Paislee. The above shot shows that the interior is lined with lavender stripes. I kept the card front at a shorter width so you can see the stripes whether the card is open or closed. Thanks so much for your visit! Enjoy your day, wherever you are. Wowwwwww! This is gorgeous! I loveeeeeeee the flower and butterfly and bee!!!! Hi Colleen! How gorgeous! I want to plant some hydrangeas in my fenced in back yard. The deer just eat my bushes to a nub and I never get to see the flowers. Have a great day dear! Good to see this gem at last; it is a jaw dropper! Very pretty card Colleen! It has me longing for all things blooming too. I think all of the spring bulbs are huddled together underground afraid to peek their pretty little heads out because it's too darn cold!!! 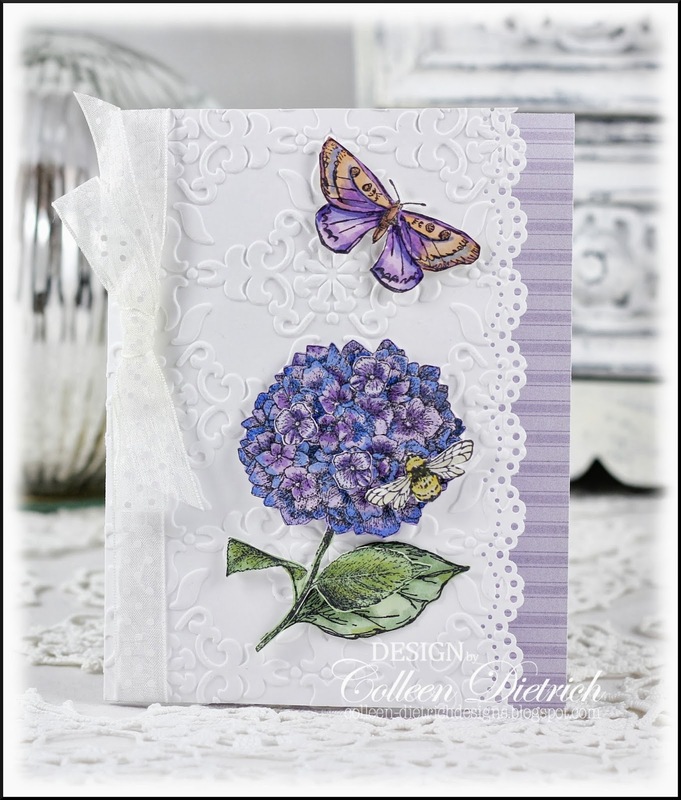 I see hydrangeas and think of you every time :) Beautiful card- love those stripes! 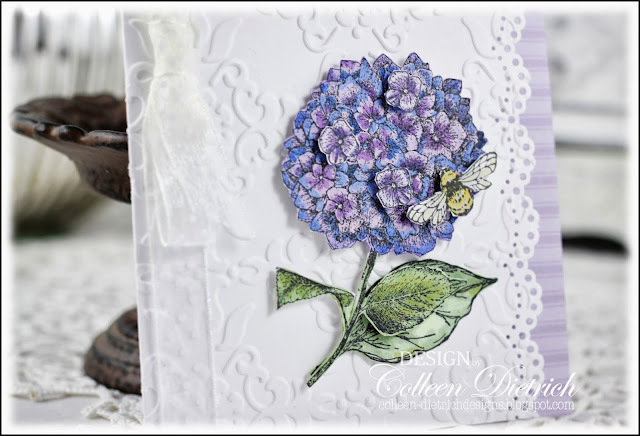 This is one of my favorite flower stamps! Love the added flowers and leaf! It's gorgeous, Colleen. Glad you found it. 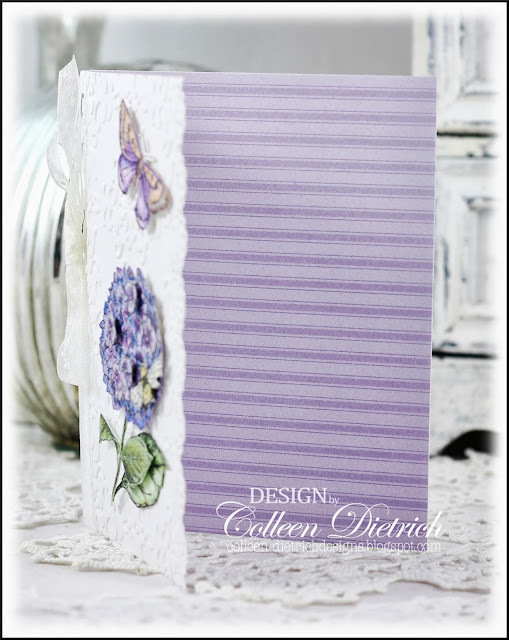 Love the stripes inside and that deep embossing. I got to work in my yard Saturday. We had a beautiful day. Oh, my goodness, it's so gorgeous! Gasp! I can't believe we almost didn't get to see this beauty. Wishing you a better spring and summer this year! I really love the whole card, from the embossed front with the beautiful Hydrangea to the wonderful inside too! I love how you showcased those pretty stripes inside, and how can you lose with that pretty hydrangea? Awesome!